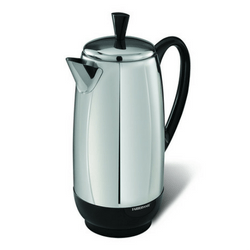 "A percolator’s approach to brewing a steaming cup of Joe is one of beautiful simplicity. By constantly running warm water through coffee grounds, it churns out a brew that is stronger than most and hot enough to get you through the dreariest of mornings." Interested in enjoying a quick and robust shot of caffeine to get you through the day? 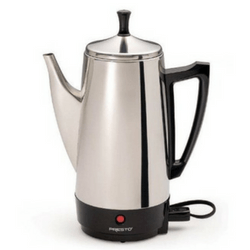 If you answered yes, you’re in the right place, as we have complied a list of the Top 10 Best Electric Coffee Percolators that you can buy right now. Say what you will about the trusty ol’ electric coffee percolator, but one thing’s for sure: this baby gets the job done! It’s been around for over a century now and gone through a number of iterations within that time. Maturing from the humble stove top percolator, we now have electric models that come packed with tons of convenient modern wizardry. It's just as fast as the Presto, brewing at a rate of about 1 cup a minute with a capacity of 12 cups. It comes equipped with a detachable cord, an indicator light to tell you that your cup of heaven is now ready and a non-drip spout to keep the mess at bay. To place the cherry on the cake, it sports a twist-off lid made of glass that allows you to see exactly what's going on inside. We love anything that makes our life so much easier. And this well-built electric coffee percolator by Hamilton Beach seems to do just that. All this convenience can be yours for $39.92. And it comes with some pretty nice tricks up its sleeve, or shall we say, spout. Takes up less space on the counter. Produces quite a bit of steam. Drain slots in the filter are rather large. 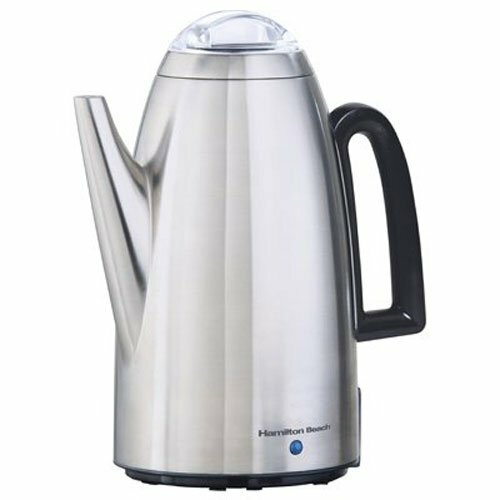 If it’s total practicality you’re after, then the Hamilton Beach 40614 is right for you. It gets major points for having a graduated viewing window that keeps you aware of just how much coffee you have left. Throw in the glass lid, and you have a percolator you’re sure to be proud of. NOTE: You might get a bit of grounds in your coffee every now and then due to the larger drain slots in the filter, but the robust flavor more than makes up for it. 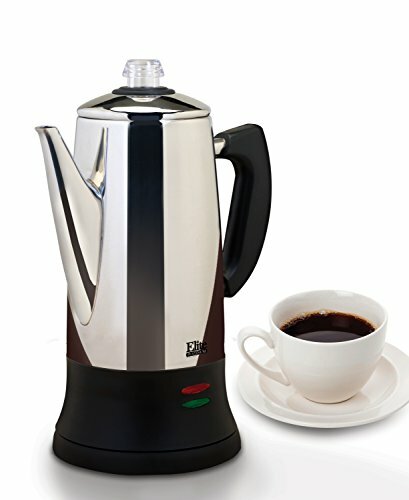 It makes a purported 12 cups of piping-hot coffee, facilitated by its 120V configuration. The brew-rate is at a staggeringly-fast 1 cup per minute, and the Joe is automatically kept nice and hot for you. One of the biggest draws is the all-steel construction; everywhere from the exterior right down to the filter basket. Presto always seems to hit the ball right out the park when it comes to design; and this #1 Best Seller on Amazon is no different. 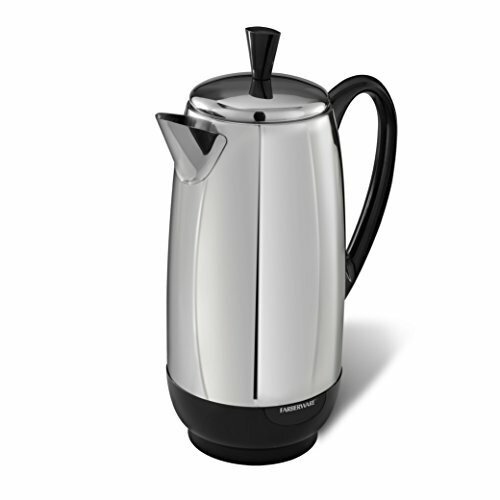 It sports a modern take on the percolators of old, making it a total beauty as it lounges there on the counter. You’ll need to cough up Check on Amazon to have this nifty machine pretty-up your kitchen. Removable cord for easy storage. Indicator light that signals when the coffee is ready. Doesn't make exactly 12 cups. Cord is a bit too short. You get quite a machine for the price. 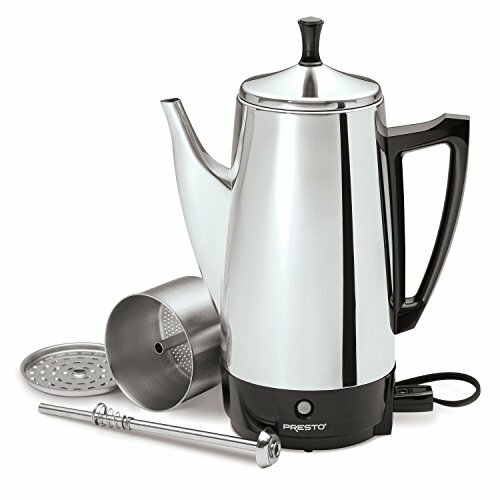 The Presto 02811 electric coffee percolator is designed to be that reliable best friend, and it definitely lives up to this. It makes more like 10 cups and not 12, but each of those cups is utterly delish. NOTE: Since it doesn’t have an automatic turn-off feature, you must be close by; definitely not the time to get on Facebook! But if you can deal with this slight inconvenience, it won’t disappoint you. First thing you'll notice is the elegant stainless steel design that looks a lot like the Presto. So it's definitely a looker. It brews from 4-12 cups, comes with a non-drip spout and a cool-to-touch handle so that you don't give yourself an unwanted tattoo. Percolators are notorious for burning coffee due to constant heating, but with the Cuisinart this isn't a problem. 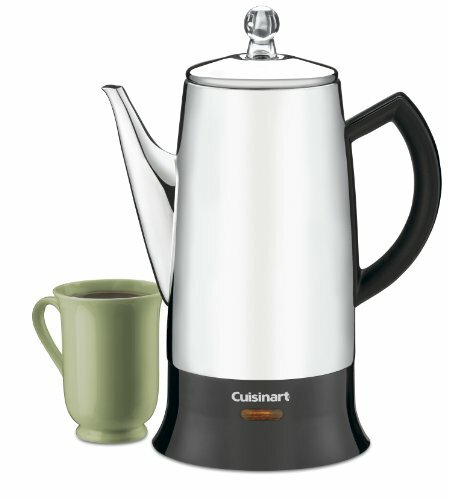 Cuisinart simply had to make the list in this quest to discover the best electric percolator coffee maker, it’s definitely a contender price wise. Cool bottom to prevent scarring. Very easy to clean and pour. Doesn't keep coffee hot for long. Not the best or brewing few cups. NOTE: One of the biggest drawbacks to the Cuisinart is its inability to keep that Joe hot for extended periods of time. But it’s a trade-off really. Yes, it won’t stay piping-hot, but it also won’t taste burnt and bitter either. So it all depends on what you value most. If you’re looking for a robust tasting brew with all the aroma locked in, then it won’t let you down. It may be mid-priced, but you wouldn’t tell that by simply looking at it. 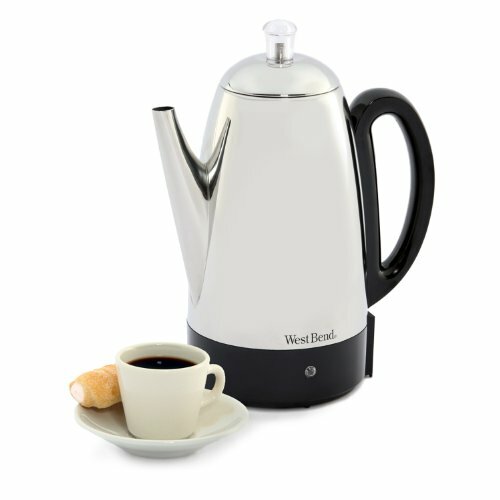 The retro stainless steel styling is brilliantly complemented by the transparent top to create a truly gorgeous percolator. It makes between 2-12 cups, has an automatic keep-on functionality and a stay-cool handle and base. The coolest feature of the West Bend though has to be the floating red ball floating in the handle, which allows you to quickly tell the number of cups in the percolator. Coming in at #4 on the list is this offering by West Bend. Its price is definitely a huge selling point and comes armed with a number of neat touches that you’ll love. Makes a decent amount of noise. ​West Bend has managed to make a pretty good machine at an amazing price. You can tell they’ve taken a bit of cost-saving measures such as the plastic top, but somehow they have managed to make even that look elegant. NOTE: The noise might be slightly annoying at first, but with time it slowly becomes endearing. It is made from durable stainless steel that has a stainless steel filter unit included. 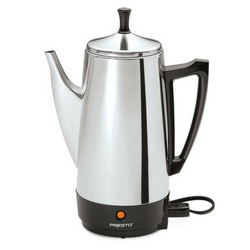 The Percolator detachable cord will allow you to move it quickly to the serving area. The indicator light turns off automatically when your coffee's ready. 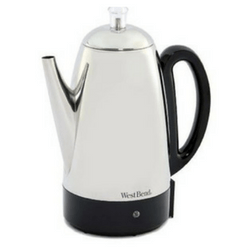 Looking at the design, the percolator has an ergonomically contoured handle and a traditional style spout that makes serving easier. It also has a stainless steel lid with a view through glass insert. To keep the coffee warm, the percolator comes with a keep warm function and an insulated base that protect the underlying surfaces. 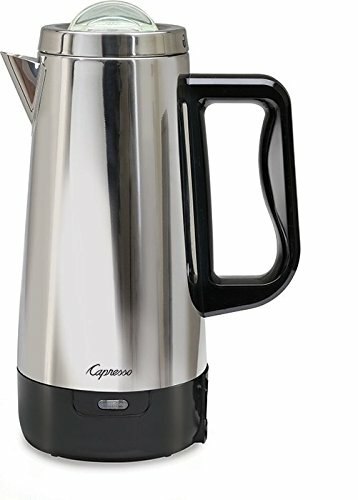 Capresso is a trusted brand of coffee percolators with this 12 cup model ranking among the best percolators in 2016/2017. This model is incredibly simple to use and helps you to brew a delicious pot of coffee in just one minute. Has a keep warm function. Detachable cord that makes it easy to move while serving. Makes 4-12 cups in less than a minute. Has no automatic switch off feature. The Capresso 12 Cup Perk Coffee Maker has a sleek design that looks like a gorgeous piece of art. 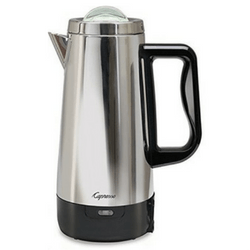 We love its sturdy stainless steel construction and inclusion of the durable stainless filter. 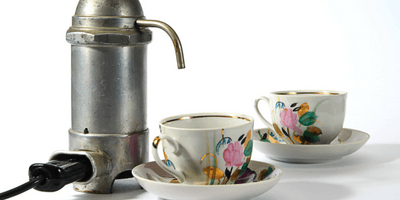 The percolator is also easy to clean and maintain. 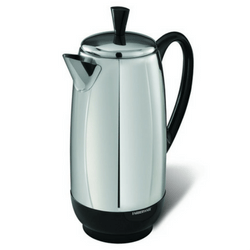 NOTE: The only concern with this percolator is that it does not have an on and off switch. The product boasts of several high-end features starting from durable construction to safety features. It comes with a cool touch base making it possible for you to use anywhere you can plug it. It has a sturdy aluminum base that withstands frequent use and has a transparent container that lets you watch the brewing process. The boiler has an automated turn off feature that prevents overheating and keeps your coffee warm for up to 30 minutes. 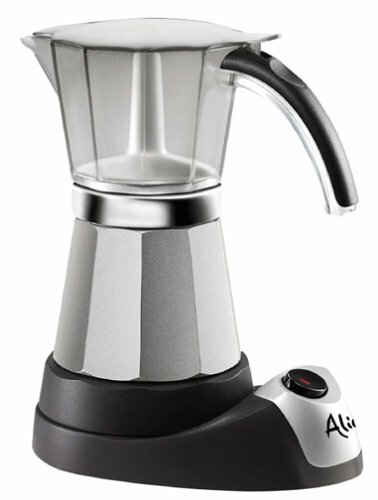 The EMK6 Alicia Electric Moka Espresso Coffee is built with quality material and engineered for convenience. 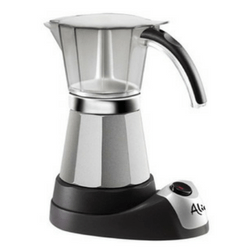 The manufacturers use the Italia concept making most coffee enthusiasts to feel a touch of Italian coffee every time they enjoy a cup of coffee. This product is space conscious and portable making a perfect addition to your kitchen or office. Sometimes the upper chamber leaks coffee. Produces a bit of steam. The product features a removable and easy to wash filter, automatic keep warm feature, power and indicator lights that alert you when the coffee is ready and a comfortable, cool handle that makes serving safe. The Maxi Matic also comes with a removable base providing a cord-free serving. Brewing a delicious hot coffee the old-fashioned way has never been easier with the MaxiMatic EC-120 Elite Platinum 12-Cup Percolator. It comes in a compact, lightweight and portable design that makes tabletop serving simple. Separate power and ready indicator lights. Auto off and boil dry safety feature. Cool touch easy grip handle. Warmer makes the coffee overcook. It has issues with auto shut off feature. A perfect choice for avid coffee lovers who are looking for a compact yet functional electric percolator on a budget. It is made from heavy-duty material to come up with an elegant design. The product features a 1000-watt heating element that gets the coffee ready in less than a minute. It also has an automatic keep warm mode, a cold touch handle and lid knob that has rolled edges for easy handling. Are you looking for something that is durable, easy to maintain and does not lower the value nor influence the taste in any way? 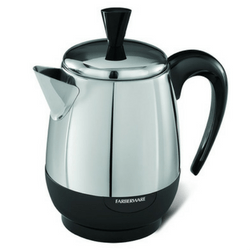 Go for the Farberware FCP240 2-4 Cup Electric Coffee Percolator. Has automatic keep warm feature. Powerful heating element that prepares coffee in less than one minute. We love the product’s compact and space efficient design that makes one of the most versatile models around. It is also backed by a one year warranty. 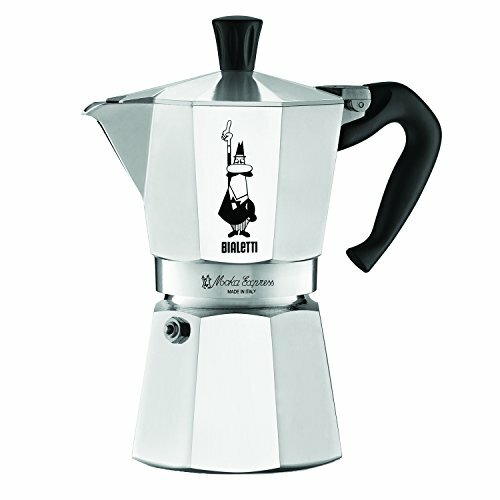 This product is the #1 Best Seller on Amazon and comes in a well-made design of Bialetti Octagon shape. It is constructed using high quality polished aluminum, which is resistant to stain, and abrasion. It has a patented safety valve, detachable cord and is easy to clean. 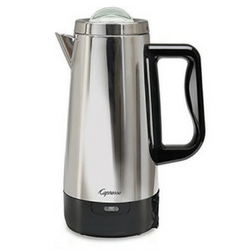 If you are looking for a coffee maker to make you a strong brew with almost no strain on your wallet, you have found it here. The Bialetti 6-Cup Stove Espresso Maker has an innovative percolating technology that extracts coffee grounds quickly to come up with a delicious coffee brew effortlessly. Easy to clean and dismantle. It takes considerable amount of time to brew coffee. The product is affordable and has a wide mouthed design that makes it easy to fill when preparing coffee. It also offers a two years warranty, which covers any manufacturer’s defects. Most coffee makers offer a one-year warranty. The pot comes with a warm heater that keeps the coffee warm and a detachable cord for simple tabletop serving and storage. It also has a cool tap handle informative coffee level indicator, non-drip spout, steel double creel filter and wind off top that locks it into a secure place. 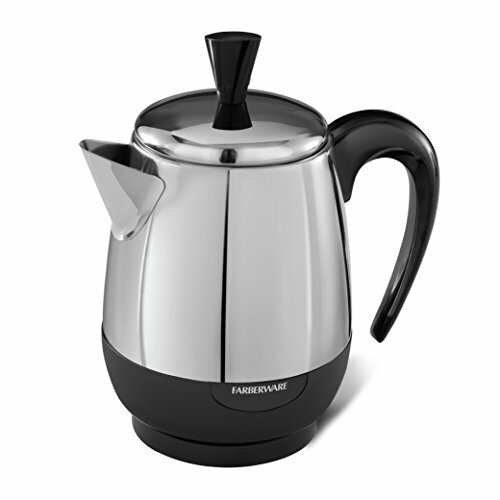 Farberware (Black + Decker) FCP412 Electric Coffee Percolator is ideal for individuals looking for a sturdy and efficient electric coffee percolator that provides tasty coffee with modern styling. Not the best to prepare less than 10 cups. No control or brew time. 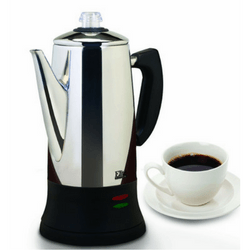 You will surely love its unique design and non-drip spout that ensures trouble free pouring. 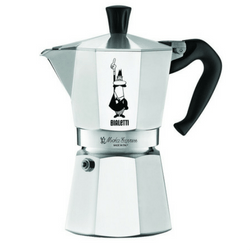 This pot is an excellent choice that helps you to make a delectable coffee all the time. All these machines make a gallant effort to be crowned the best electric coffee percolator. 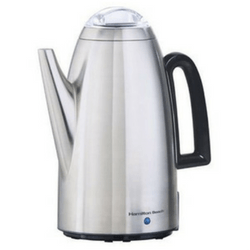 But all things considered, the Hamilton Beach 40614 Twist Lid Percolator takes the top spot for best electric coffee percolator. Handy features, such as the twist lid and coffee-level viewing window, take practicality to the next level. And the coffee it produces in nothing short of delectable! The Presto is the undoubted runner-up, with its staggering speed earning it major points. 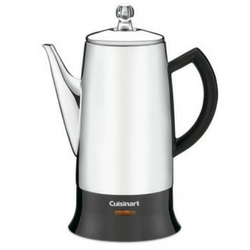 If you're looking for a quality coffee percolator with amazing build, then the Cuisinart is sure to deliver. And if you're on a budget, the West Bend will give you amazing value for money. 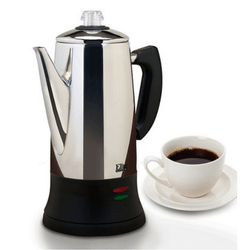 If you would like more information on the best electric coffee percolators or have any further questions, please feel free to leave a comment below​. We look forward to hearing from you.